The tomb took several generations, around fifty years, to build. The white facing stones come from the Wicklow Mountains, 70km away south of Dublin. The egg shaped stones are sourced 70km to the north. The larger perimeter stones would have been brought 20km. All of this in times before the invention of the wheel or domestication of animals. The 1960s restoration of the stone cladding to the front of the tomb is controversial especially with the use of cement to achieve a near vertical face. 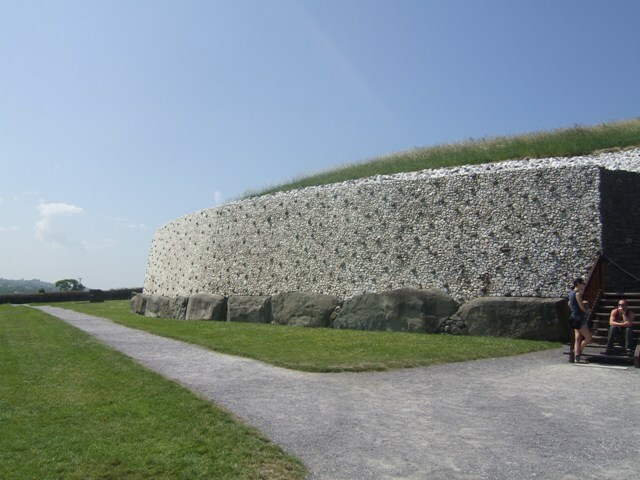 At Knowth the white stones act as a pavement outside the tomb.